and I comprehsively deal with SPA& Wellness consulting. 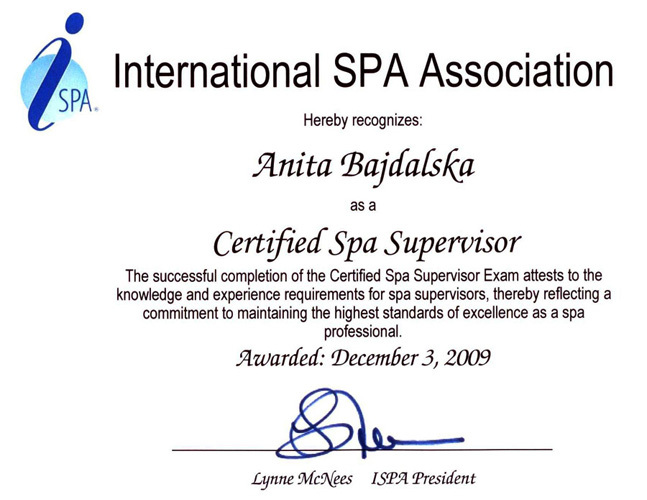 Expertise, over 11 years of experience in managing SPA, and what's the most valuable experience in the best European SPA hotel: Austria and Switzerland where I studied the SPA & Wellness industry. Today I am a substantive supervisor of post-graduate studies and a lecturer in the field of "Hotel management and SPA & Wellness facilities" at the WSB in Szczecin. Anita Bajdalska’s SPA Manager is a company that comprehensively deals with the implementation of SPA & Wellness facilities since 2007. Actually, every area of the SPA & Wellness industry is well known to me and there are no secrets to me. The PRACTICE for creating and managing such projects allows me today in my work as a SPA consultant, use knowledge and practical experience in building new, interesting SPA & Wellness projects, and most importantly protect investors who trusted me against mistakes that can cost them dearly.